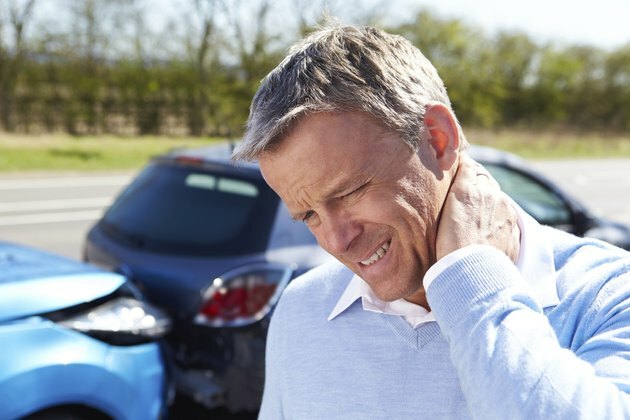 Cervical dizziness, also known as cervical vertigo, is usually cased by neck or head injury such as whiplash, or compression of the arteries in your neck. The most common symptoms are dizziness when you move your neck and ear pain. Gentle neck mobilization exercises are often recommended as part of the treatment, but you should seek medical advice before performing them. Do this exercise sitting down and with your eyes open. Move your head up and down 20 times, then turn your head from side to side 20 times. Start slowly but speed up as you get used to the exercise. As your dizziness improves, try doing these exercises with your eyes closed. While sitting down, shrug your shoulders up and down 20 times then turn your shoulders from left to right 20 times. Stay seated and bend over as if you're picking something up off the floor, and then straighten up. Repeat this movement 20 times. Once you've mastered the seated exercises, you are ready for the more advanced ones. Sit down and stand up 20 times with your eyes open and, when you feel ready, try the exercise with your eyes closed. Stand up and turn in a circle on the spot, first with your eyes open then with your eyes closed. Speed up as your dizziness subsides. When you feel ready, try walking across the room with your eyes open and then with them closed. For this exercise, in particular, you should make sure you are in a safe space and have someone in the room to guide you. Spend one hour a day doing these exercises, but break the time up into five-minute sessions. Make sure you have plenty of space to perform these exercises and that the area is clear from debris or items that may cause injury if you lose your balance. It might also help to have a friend with you when you first start doing the exercises to provide support if needed. These exercises may cause some discomfort or dizziness, which is normal. Stop if you feel pain or if they make you feel unwell.